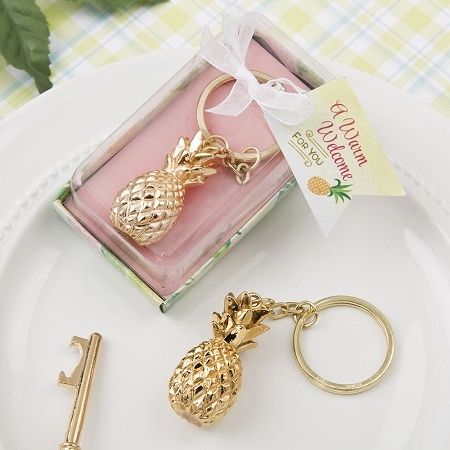 From the Warm Welcome Collection, we are proud to offer this gold pineapple themed key chain. The pineapple traditionally symbolizes 'welcome' and hospitality, as well as friendship, generosity and other forms of social warmth and graciousness. The little replica of a pineapple is crafted from poly resin in a three dimensional perspective and is plated in shiny gold. 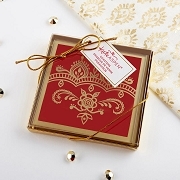 The pineapple charm is attached to a gold metal chain and gold metal key ring and comes packaged in a beautiful tropical themed box. 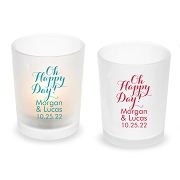 Offer your loved ones a Warm Welcome! 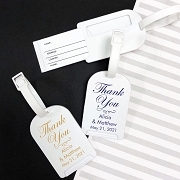 A perfect favor for any celebration! Size of figurine 1 3/4" x 3/4"
Size with chain 3 1/2"
The pineapple traditionally symbolizes 'welcome' and hospitality, friendship, generosity and other forms of social warmth and graciousness. 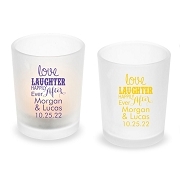 The perfect favor for any occasion!